One of the many things that I love about Cortana on my Windows Phone is the ability to set up quiet hours. Quiet Hours are a designated time – planned or at the moment – where my phone will not disturb me with notifications, phone calls or the like unless someone in a group I designate (my Inner Circle) messages or calls twice in short succession. In my move from iPhone to Windows Phone, this is one of the great features of iOS that I missed when I started back. Windows Phone without Cortana doesn’t have quiet hours and it, if I’m honest, was one of the main reasons I updated my Lumia 1320 to Windows Phone 8.1 Update 1. Yeah, I’m sad, I know. Cortana Quiet Hours are great for times when you are meeting or, in my case, traveling where my phone is in the same room as me. Setting these up are easy to do and you can do it from multiple places on your Windows Phone. For this How To I am assuming that you have Windows Phone 8.1 with Cortana in the United States or Update 1 outside of the United States (which is the only way you can get Cortana). Right now you have to have Cortana in order for Quiet Hours to work. tell her all kinds of interesting things like your interests, inner circle and your quiet hours. Top on quiet hours and you will get to the settings. Basically you have two options. You can either set up quiet hours at the moment (i.e. you are going into a cinema for example) or you can setup automatic rules. 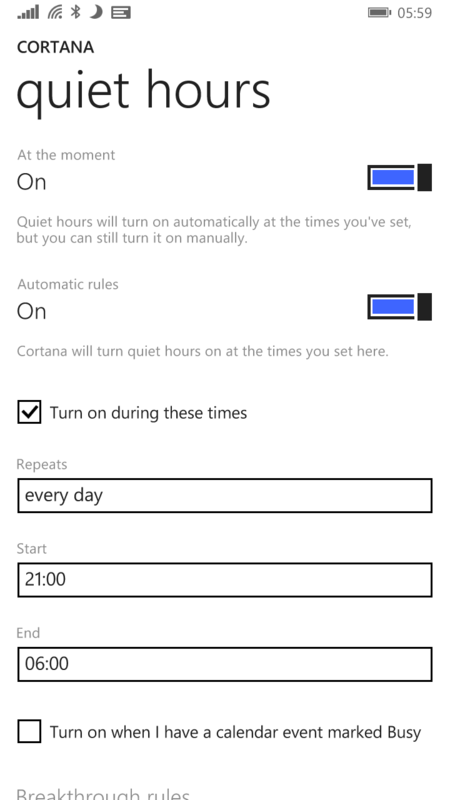 In my case I have automatic rules setup for my Windows Phone to go quiet between 21:00 and 6:00 every day. Now just because you have automatic rules setup does not mean you cannot override it with the At the moment setting. If you are going into an impromptu meeting or the like and want to make sure you are not disturbed, you can quickly set Cortana Quiet Hours on. Just remember if you do this to turn off this manual override. You can also have Cortana pay attention to your calendar and if you are in a meeting or event marked busy, she can automatically turn on Quiet Hours for the duration of that event. One of the keys however is having the ability to override Cortana Quiet Hours in an emergency. For example, if I am traveling, I want to be woken if my wife or kids call in case there is some event or emergency I need to be made aware of during the night. This is where my Inner Circle comes in. 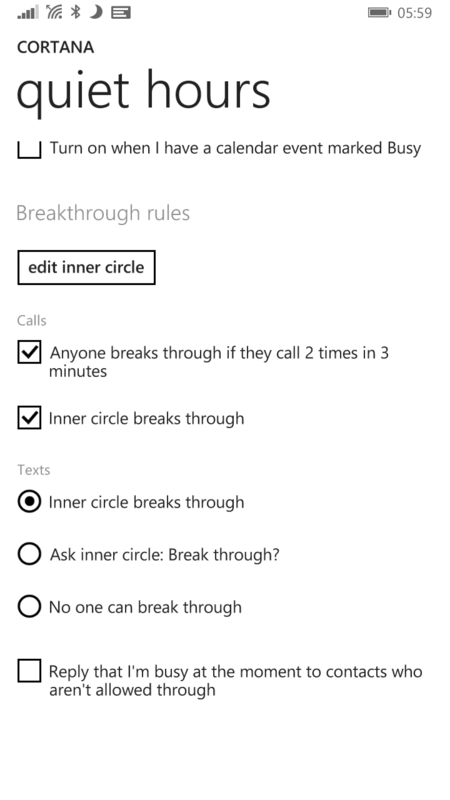 Inner Circle allows you to designate people who can break through the Cortana Quiet Hours with their calls or texts. If you scroll down on the Quiet Hours settings you will see the Breakthrough rules and the first option is to edit your inner circle. Once you have yours defined then you can determine if they can break through by using the checkbox for calls and radio buttons for texts. You can also designate that if someone outside of your inner circle calls twice in 3 minutes that they can break through. For more How To’s be sure to check out my How To page. Have a suggestion for a How To? Leave me a comment here or hit me up on Twitter or Facebook. I am having a problem opening the Cortana notebook! I want to access and turn on quiet hour.